Sometimes collaborating, sometimes working independently, Jean Whitesavage and Nick Lyle design and fabricate artworks in hand forged steel, as well as a variety of other media, such as stained glass, hand-painted porcelain enamel, masonry and wood. �Jean Whitesavage has a Bachelor of Fine Arts in Painting from the Tyler School of Art, in Philadelphia. During her undergraduate study, she attended Temple University’s campus in Rome, Italy.� She received her Masters Degree in Sculpture from the New York State College of Ceramics at Alfred University where she worked mostly in steel, cast iron and bronze. �� � Nick Lyle has a Bachelor of Arts in the History of Ideas from Williams College, Williamstown, Massachusetts. 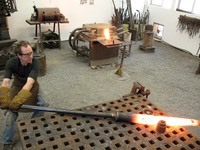 He has studied drawing, painting and glassblowing, as well as apprenticing with a stonemason, a blacksmith, a cabinetmaker and a sculptor. �� � In 1991 Nick and Jean moved from New York State to Seattle, Washington, where they began to collaborate together on sculptural art projects. 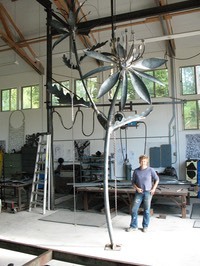 They work primarily in hand forged steel, incorporating traditional blacksmithing methods with modern steel fabrication techniques to create their sculpture.� Nick and Jean’s public artwork is always designed for a specific site. They often design work that is integrated directly into functional elements of a public space. In 2005 Jean and Nick moved to Whidbey Island where they have built a new studio.